Considering a switch to Pentax? The K-01 comes after the K-5 and K-r series of DSLRs. It was also proceeded by Pentax’s first mirrorless camera called the Q, however that camera was a completely new system. 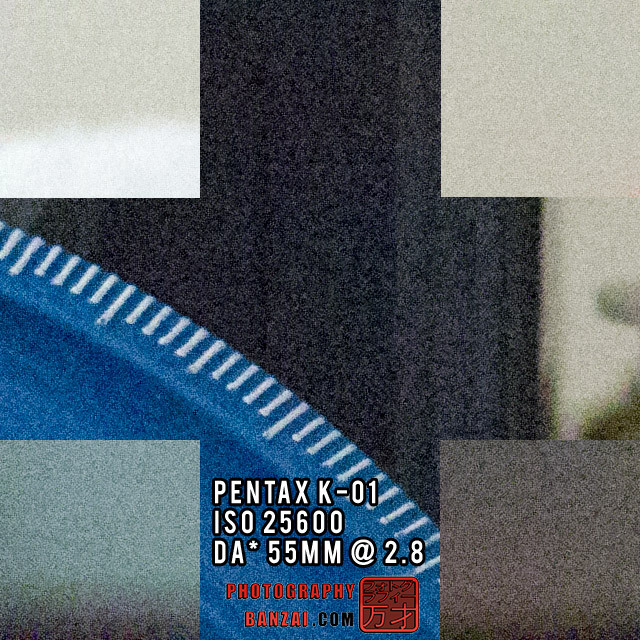 The K-01 appears to have a mixture of components from the K-5, and in some simple aspects, the Q camera. It has an improved imaging engine that shares a few features of the Q such as manual video control with MPEG4 encoding and full time live-view, but primarily takes components and features from the K-5 series such as the 16mp sensor and K-mount. It is certainly a unique concept in the camera world being the first mirrorless to use an existing SLR system mount. I bought the K-01 as a replacement for my K-7 camera that was having issues. If you have visited my site before, you probably know by now that I frequently use two cameras at once. Each camera has a prime lens attached and serves a different purpose from the other. This allows me to have a nice range of possibilities in framing as well as functionality. Buying a second K-5 would have meant losing out on all of the incremental improvements the K-01 has. Video is something I’m always interested in spending more time on, so it seemed like a good fit. The decrease in size, while not extensive, is a welcome addition that allows me a bit more room when fitting the gear I want into smaller bags. The mirrorless nature of the camera fits my current goals in a second camera. Video is a more natural process with a mirrorless camera and using a camera with dedicated live-view surprisingly brings out a new style of framing subjects I wouldn’t normally explore with a standard SLR camera. I fought long an hard about the quirky styling and ergonomics before the purchase, but after using it for a while, I see that it is a solid second camera. Here is my 25 minute review of the camera on Youtube. Enjoy. The K-01 is a completely new and unique design. The mastermind behind it was Marc Newson, who certainly shows his style in the camera look and button layout. The main control dial is on the top with the modes: M (Manual), B (Bulb), *no flash*, HDR (automatic high dynamic range), SCN (Scene), AUTO, *movie*, P (Program), Tv (shutter priority), and Av (aperture priority). The dial itself does not have a lock like the K-5, but it is quite stiff and shouldn’t be prone to accidental changes. Placement of the main dial is somewhat decent, but still requires two hands like most large format cameras. The shutter and on/off switch are grouped together like all existing Pentax DSLRs, but in this case the design is quite different. The on/off switch is elongated for easy access and works quite well. It doesn’t seem prone to accidental switching because it takes a reasonable amount of force to toggle the switch. Main dial, green button, red button, and the exposure compensation button: The camera comes with a single dial that makes it somewhat less convenient to make setting changes compared to cameras like the K-5. The dial itself is in a good position and has a tactile feel to it. Along with the main dial, there are three buttons surrounding it. 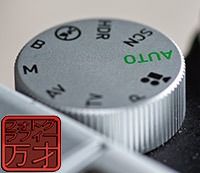 The Green button is a Pentax specific feature that generally allows you to reset a key value like exposure compensation, or give an initial exposure reading in manual mode. The negative of the green button on this cameras is that it isn’t accessible by the right hand. The red button and exposure compensation buttons are in a good position and provide exposure control as well as a quick way to take video respectively. The exposure compensation button has different purposes depending on which mode you are in. In modes like P and Av, you have standard exposure compensation with a positive or negative numerical value. In Tv you basically achieve TAv mode of the more advanced cameras like the K-5, because that allows you to change aperture in Tv mode. In M, it allows you to toggle between shutter speed and aperture adjustment with the primary dial as the actual value changing method. Back panel buttons: AF/AE-L dual purpose button, Play, Info, Menu, ISO, flash, timer/drive, and white balance are available. It is somewhat minimal compared to Pentax DLSRs, but still provides enough quick access to be functional. Having a dedicated ISO button is important, so it was good that Pentax replaced the image tone button with ISO. I would have preferred two buttons instead of a combined AF/AE-L button. Flash/trash and AF/MF switch: The flash pop-up button is now dual purpose because it allows you to delete an image in “Play” mode. The AF/MF switch is placed like many Pentax SLRs, but does not include a continuous drive selector as some of the more advanced models do. It is actually a bit easier to use than the entry level SLRs I’ve experienced in the past because when in the MF position, it protrudes slightly, making it easier to push back down. – The movie record button forces the use of Program mode instead of whatever movie mode I have selected in the options menu. This makes the quick video recording button a lot less useful to me. – There should be some form of audio levels indicator on screen when video is being recorded, but it doesn’t have that. – My initial tests with shake reduction in video is that it appears to make the resulting videos worse than when it is off. It seems to add more visible jiggle and other odd artifacts to the final result. This will require a lot more testing. Hopefully, if there is an actual issue, it will be resolved with a firmware update. The camera is still on v1.0. – Framing is a challenge in bright sun, but the LCD is reasonably sharp. The LCD cover can glare because it is naturally reflective. There is brightness control to counteract this issue, but I have not tried it yet (it requires manual adjustment, would have preferred an automatic option). – Green button placement is really bad. 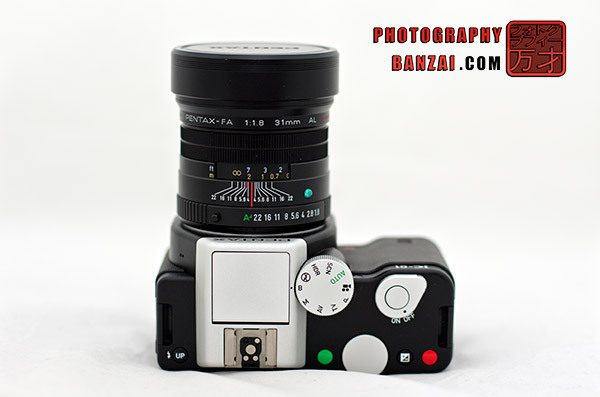 Try pressing the green button and exposure compensation button at the same time with one hand. I can easily do that with the K-5. – Auto-focus is generally nice and chipper, but there are some situations where it won’t focus, but it doesn’t make much sense why given the available light. Hopefully that will be improved with firmware updates. I’ve found an issue where I get unwanted back-focusing with center point AF, but not with selectable point. Needless to say, I stick with selectable point because it does the same exact thing and allows me easily change the point area if I desire that. – 1/4000th maximum shutter speed is somewhat of an issue for users of large aperture glass in daylight. No mirrorless cameras to this point have faster maximum shutter speeds. A missed opportunity in my opinion, because even the K-r and the K-30 will have 1/6000th maximum. ND filters are an option, but they add extra cost and are something extra to carry around. – Burst rates and buffer seem to be limited. As of the v1.0 firmware, I can get around 8 JPEGS at the maximum of 6 FPS before it slows down. RAW gets around 1 FPS continuous without a change in speed as the buffer fills. It seems like RAW speed is artificially limited. – It’s a quick camera without perceivable shutter lag. I shoot RAW and haven’t felt like I had to wait for the camera to catch up to me at all for my uses at the moment. – The camera doesn’t have the stigma of SLRs, and from my experience so far, it doesn’t get those random negative looks a SLR can sometimes bring. – The screen refresh rate is nice and fast. This is a pleasure to use compared to the K-5 and earlier DSLRs. – Peaking is a great feature that makes using manual focus glass fast and easy. This alone would be reason enough to consider a K-01. – More composition range. I feel like I’m taking photos in a different way and at different angles now. An interesting change from eye-level SLR photography. – Relatively fast 6fps JPEG continuous mode. In a pinch, I would resort to using JPEG if I needed it for a quick 1-2 second bout of action. – Smaller than the K-5, but with many similar features and some enhancements. The size difference isn’t massive, but enough to help me fit what I need into an average sized bag. – Takes K-mount lenses without an adapter. It seems smaller than a NEX-7 when that has the expensive A-mount adapter connected to it. – In-camera shake reduction that works with any lens. – Improved video control over the K-5. Now full manual control is possible. Many of the settings can be changed while recording. – MIC port with level control. 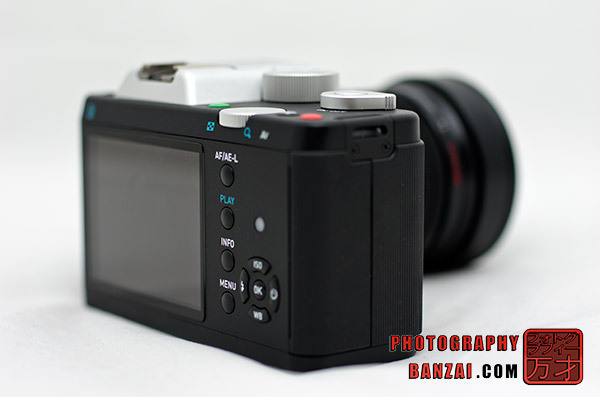 – It fits well into an existing Pentax user’s system, because it uses the same batteries as the K-7, K-5, and 645D and has a similar overall feel. – The menu system of the camera, like other recent Pentax DSLRs, is quick to use and easy to navigate. – It uses DNG RAW format that I prefer over any other RAW format out there. It is easy and does not require me to update my editing software when I buy a new camera. For someone who isn’t already invested in the Pentax SLR system, they might have a hard time seeing the positives of this camera. I would suggest first looking at the entire system of lenses and accessories that are currently available. There are many small wonderful prime lenses that are encased in metal, which are pretty appealing and fun to use compared to the now-standard plastic. I think we can also eventually expect some special lenses designed especially for the K-01 and future mirrorless K-mount cameras that use the empty interior area of the camera instead of protruding the lens as if it were a standard k-mount one. If you want to use old k-mount or m42 screw-mount lenses with minimal issue, this camera seems like the best choice for that. It has focus peaking, so using m42 with exacting focus abilities is as simple as putting a thin adapter ring between the lens and camera. Older K-mount lenses will carry over all of their functionality that they originally had such as automatic aperture control. You can expect top quality results because the sensor in the K-01 is top-notch and K-mount is a mature system with many lenses to choose from. If you buy a K-01 and eventually want something more powerful, you can easily upgrade and take your lenses with you (assuming you don’t buy any special K-01 mirrorless-specific lenses they might make in the future). The photos were taken with a DA* 55mm f1.4 @ f2.8 and cropped in a special Photoshop action. The crop action takes a 640 pixel square center section and then pulls in sections from the corners, pasting it all together giving 100% crops. The camera was focused once and then placed in manual focus. A 2-second timer was used to minimize camera shake and internal SR was turned off. All noise reduction settings were set to AUTO. Click on each image to see the larger version in a new window. The K-01 isn’t for everyone, but it certainly provides enough value to me that I can do unique things with it over my other cameras (currently a K-7 and K-5). It has strong image quality with most of the features of a DSLR in a somewhat smaller package than a traditional SLR. It provides unique framing opportunities that feel more natural with a mirrorless camera over a traditional SLR, but with the same exact lenses I use right now. I won’t be locked into a new mirrorless system with limited dedicated lens selection, and when I buy a new lens, it will work on all of my cameras without any fuss or expensive adapters. It’s nice to see the improvements of a mirrorless camera such as the natural affinity to video, yet still keeping my existing equipment completely relevant. The camera have some ergonomic quirks that irk me, but they are not something I can’t deal with in practice. The camera has some odd omissions that I think could be fixed in firmware (no peaking while recording video, SR seems quirky with video, movie button forces P mode, HDMI doesn’t have liveview/video output, lacking a high video bit-rate option for max. quality, and no audio level indication when recording), but overall it is a great second camera. 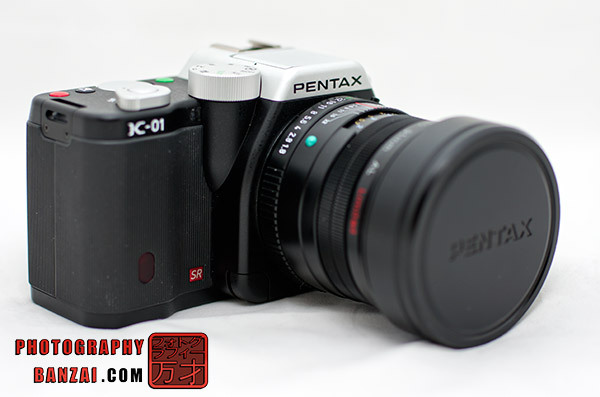 This entry was posted in Camera, Reviews and tagged camera, details, k-01, k01, mirrorless, overview, pentax, review, video. Bookmark the permalink.